Ideal for indoor playrooms and easy to assemble, this Multi-Use Foam Play Mat creates a soft, safe surface to play or workout on. 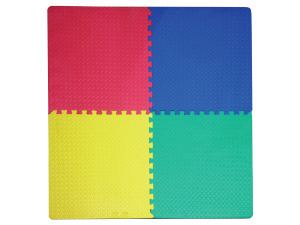 Simply piece together the colorful interlocking squares like a puzzle. No tools required. Easy to clean with soap and water or wipes. Each piece measures approximately 24" x 24" x 0.25" and 4' x 4' when assembled. Comes shrink-wrapped. Package measures approximately 24" x 24" x 1.5". 1 pcs. 2 pcs. 3 pcs. 4 pcs. 6 pcs.